Following Chanler’s return to New York in 1902, he purchased a townhouse on East Nineteenth Street that became a social center for New York’s art community. Stimulated by his so-called House of Fantasy, which was decorated with his own work, his wealthy friends began to commission elaborate murals and painted screens for their own residences and for the exclusive Colony Club in New York. Chanler worked with a limited range of subject matter—mostly animals—to create allegorical fantasies in a naïve, spontaneous style. While he pulled his imagery from nature, his concern was not faithful representation but capturing the spirit of nature and of life in an emotional way. Drawing inspiration from ancient Egypt, the Far East, and the Italian Renaissance, he used rich pigments, metallic overlays, and glazes to enhance the symbolic potential of his subjects. The screens were not radical in terms of either subject or style, but they were considered modern because of their esoteric quality and their fusion of Eastern and Western traditions. 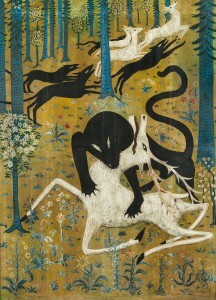 Christian Brinton, The Robert Winthrop Chanler Exhibition, exh. cat. (New York: Chanler Studios, 1922), n.p. Ibid. ; “R. W. Chanler Dead; Eminent as an Artist,” New York Times, October 25, 1930, 12; and Betsy Fahlman, “Robert Winthrop Chanler: Flamboyant American Modernist,” Southeastern College Art Conference Review 16, no. 3 (2013). See Brinton. See also Ivan Narodny, The Art of Robert Winthrop Chanler (New York: William Helburn, 1922). Milton Brown, The Story of the Armory Show, rev. ed. (New York: Abbeville Press, 1988), 145, 203.